This spring Snyder was awarded first place in the pastel category at the Society of Washington Artists' show for a painting she will bring to Camas. The exhibit opens with a First Friday reception from 5 to 8 p.m., upstairs in the Camas Public Library. "I began my interest in art as a young girl, doing clothing design and playing with colorful fabrics. Later in life after a bachelor's degrees from Oregon, an MBA from Pepperdine, and pursuing my business career for 35 years, I had a clear vision that I wanted to paint pastels. Why? Because of the vibrant colors and interesting mark-making that fascinated me." "After I retired I went Medallion Art School in Vancouver to learn the basics of drawing and went through to working with charcoal there. After that I "self taught" in pastel work for a few months, until I met a wonderful pastel artist in Hood River, Karen Watson. Karen has been my mentor for nearly 4 years I have also studied with Liz Haywood Sullivan, Brenda Boylan, and this year with Marla Bagetta in a Masters Class, all professional pastelists and extremely gifted artists." "I was unanimously juried into GALLERY 360, joined the Mosaic Arts Alliance in Vancouver in 2014 and have continued to work on my skills. I love this work and continue to learn new applications and challenge my color consciousness. Everything I produce is different; as my "eye" continues to evolve. It's all about color for me." 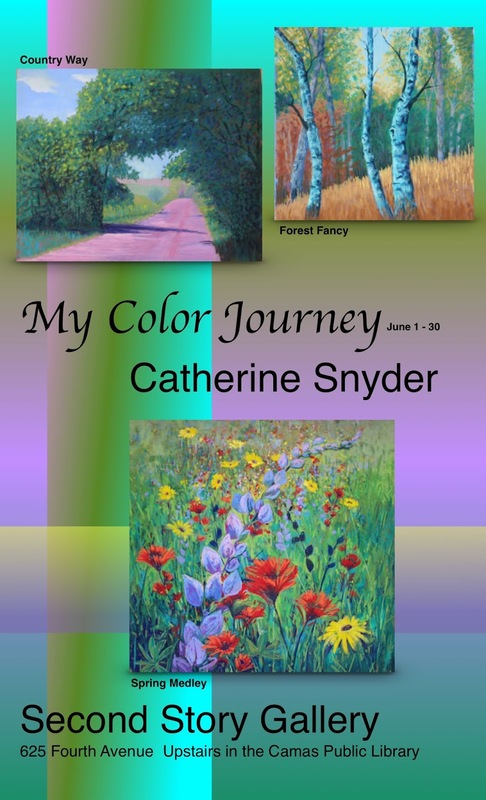 Following the June 1 opening reception, My Color Journey will be available for viewing during regular library hours, 10 a.m. to 8 p.m. Monday through Wednesday, 10 a.m. to 6 p.m. Thursday through Saturday.